Indianapolis, Indiana, circa 1907. 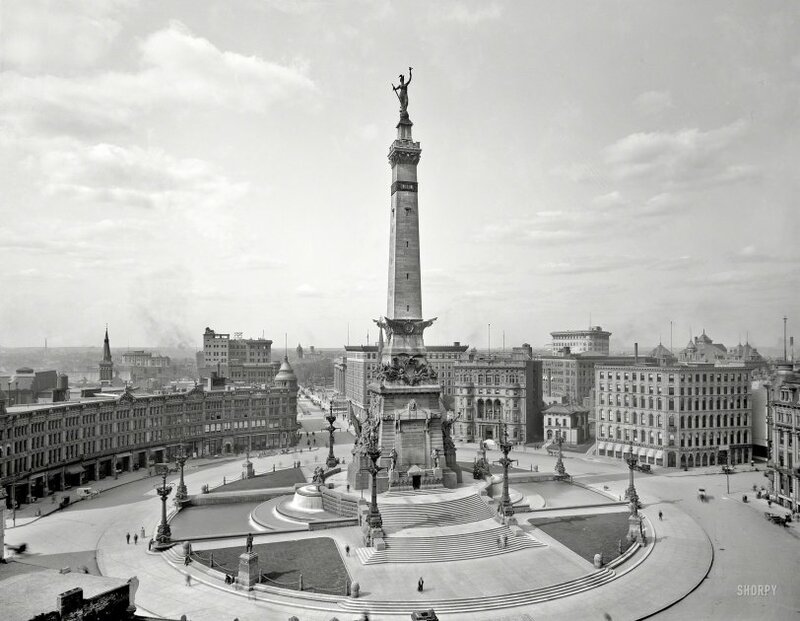 "Soldiers' and Sailors' Monument." 8x10 inch dry plate glass negative, Detroit Publishing Company. View full size. Submitted by Doug F. on Mon, 11/19/2012 - 7:29pm. I noticed the horses and buggies are traveling in both directions on the circle, Indiana's earliest "roundabout." Traffic now only flows in one direction, counterclockwise. Submitted by BigAl42 on Mon, 11/19/2012 - 3:20am. Wow. Brilliant. And how different it looks today. The only other building I can see that still remains is the building on the north exit from the square (just before the park) with the columns and stairs in front. Submitted by Emil Blatz on Mon, 11/19/2012 - 12:42am. And many of the facades of the buildings facing the circle were being held up by iron superstructures. They were preserving the facades for later back filling by more modern architecture. Submitted by englandredsox on Sun, 11/18/2012 - 2:02pm. What an amazing monument,designed by Bruno Schmitz (1858-1916) who also designed among other things the German Pavilion for the 1904 World's Fair in St Louis. More here. Submitted by Michael R on Sun, 11/18/2012 - 11:38am. 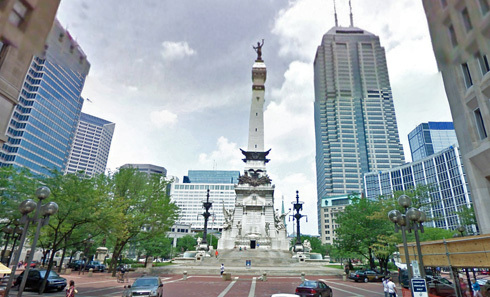 There is one building left standing around the perimeter of Monument Circle from the time of this photograph, but it is practically invisible: Christ Church Cathedral, built in 1857 (according to the mavens at Wikipedia), lies hidden behind the Monument at the northeast corner of Monument Circle and Meridian Street. Other than that, the only surviving building in the photograph appears to be the US Courthouse (1902-1905), a small sliver of which may be seen set back from Meridian Street behind a balustrade, two blocks north of the Monument. Submitted by jdowling23 on Sun, 11/18/2012 - 9:14am. A totally unexpected and beautiful view of a Midwestern US city. While many places like this still exist in Europe, it appears that everything here except the monument itself has been wiped away. We can't even blame it on war.